...prove me now herewith, saith the Lord of hosts, if I will not open you the windows of heaven, and pour you out a blessing, that there shall not be room enough to receive it. 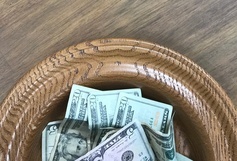 Bringing the first 10% of our income to God feels overwhelming, but Malachi 3:10 tells us that when we tithe and bring back to God what is already His, He will bless us. Tithing is about learning to trust that God will keep that promise. Mal. 3:10 is the only place where God tells us to test Him, and that test is in the area of giving. 1. Register for the challenge and commit to tithing 10% of your income for 90 days. 2. Return 10% of your income to God for 3 months through giving. 3. Record what God has done in your life for 3 months and share your story. The mission of Calvary Baptist Church is Honoring God, Building Lives, and Reaching Others. Last year, we saw at least 200 souls accept Christ as Savior directly through our outreach ministries. We also made over 130,000 visits, and gave over $280,000 to missions around the world. The Calvary family was also involved in our community through direct involvement with our city, Journey Through Bethlehem, outreach in area schools, an addiction ministry, a bus ministry, and more. An independent church auditor performs an annual audit of our finances on a yearly basis. Conducting an audit is not a symbol of distrust. It is a mark of responsibility. It is good stewardship demonstrated for all to see. We subject our financial records to this audit to protect our ministry from unwarranted charges of careless or improper handling of funds. Thank you for your faithfulness in giving to the Lord! Without your faithful giving Calvary could not have the impact that we do around the world. It is through the tithes and offerings of God's people that He accomplishes His work through His church. In 1 Corinthians 4:2, the Bible tells us, "Moreover it is required in stewards, that a man be found faithful." It is important for us, as his stewards, to realize that everything we have belongs to God. Therefore, we should be faithful to Him in our every area of our lives which includes the giving of our material resources to Him.